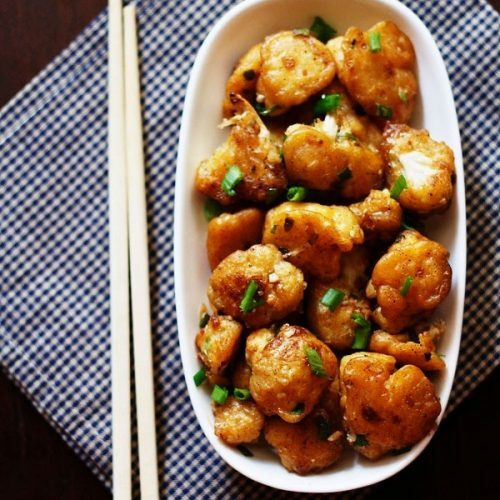 dry cauliflower manchurian recipe - indo chinese recipe of pan fried cauliflower florets coated with a spicy sauce. 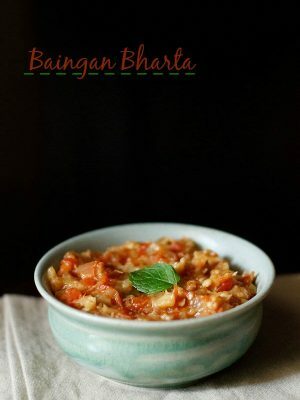 dry gobi manchurian recipe with step by step photos – easy to prepare, delicious starter snack of dry cauliflower manchurian from the indo chinese cuisine. 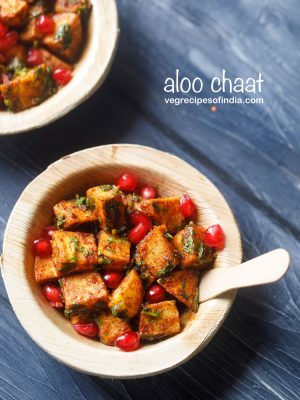 this gobi manchurian recipe is a dry version and makes for an excellent starter/side dish or snack. i have already posted a gobi manchurian recipe with sauce. when i make veg fried rice or a simple fried rice without any veggies, i prepare the gobi manchurian with sauce or as we say in india, with gravy. 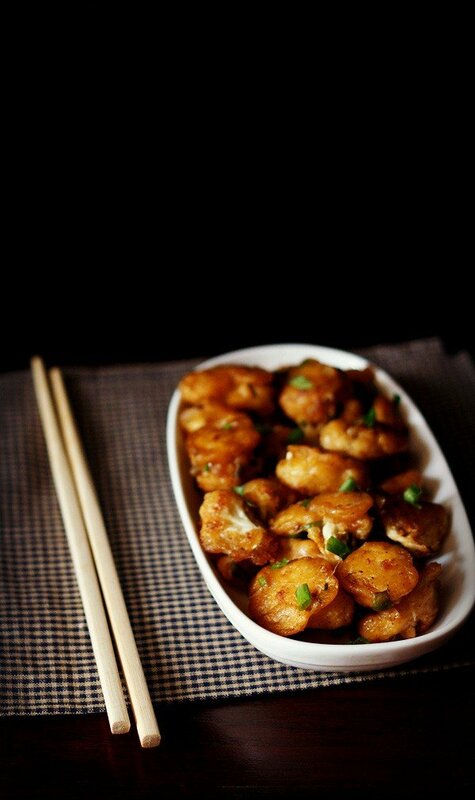 fairly easy to prepare, this delicious gobi manchurian dry recipe is not spicy like the restaurant or street versions. 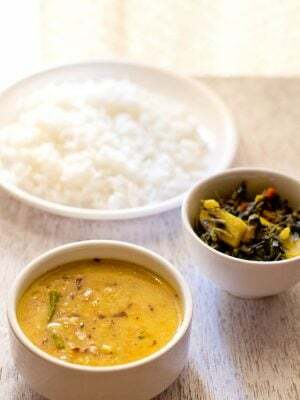 if you want, you can add more of the ginger, garlic and green chilies and increase the spice and heat in the dish. the gobi manchurian dry that we get outside has a good amount of red color added to the batter. here, no colors are added. to get an orangish color, you can increase the amount of kashmiri red chili powder or deghi mirch. 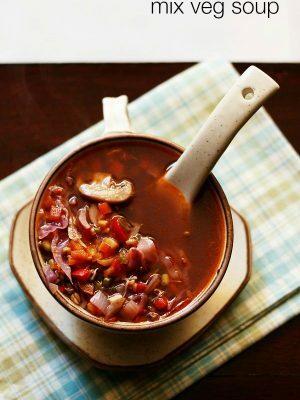 this will also add some heat and a smoky flavor. to cut down the fat, i have not deep fried the gobi florets. it does reduce the crispness, though. but as a healthier option, i have pan fried the gobi florets. if you prefer, you can deep fry the batter coated cauliflower florets. usually at home, i serve the gobi manchurian dry with rotis. as thats how we prefer it. 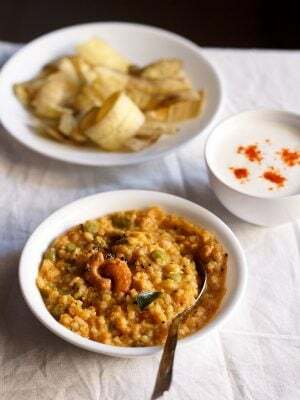 you can serve them plain with a spicy sauce like schezwan sauce or even red chili garlic chutney. even tomato sauce goes well. you can also wrap the cauliflower manchurian in a thin roti and top with some shredded carrots, cabbage and onions along with some sauce. you can also serve this dry gobi manchurian as a snack or as a side dish with veg fried rice or hakka noodles or noodles or burnt garlic fried rice or 5 spice rice. firstly chop or break the gobi/cauliflower in medium size florets. heat water with salt and boil it. 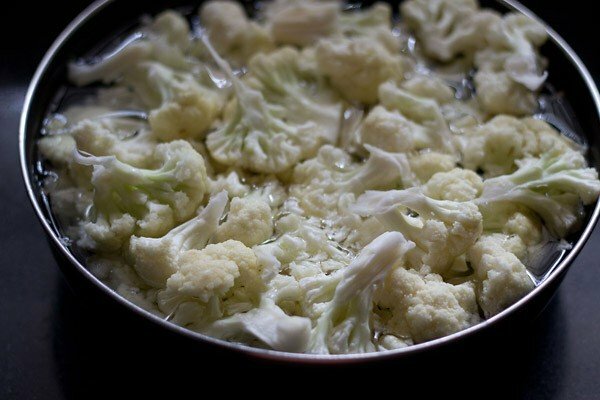 rinse the cauliflower florets and add them to the hot water. let them get blanched in the water for 15-20 minutes. later drain and keep aside. in a bowl mix together the ingredients for making the batter - all purpose flour/maida, corn starch, soy sauce, black pepper, kashmiri red chili powder and salt. 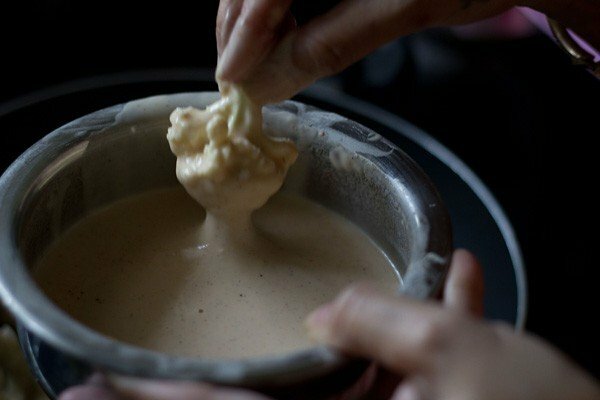 add water and whisk to make a smooth batter without any lumps. dip each gobi floret in the batter. 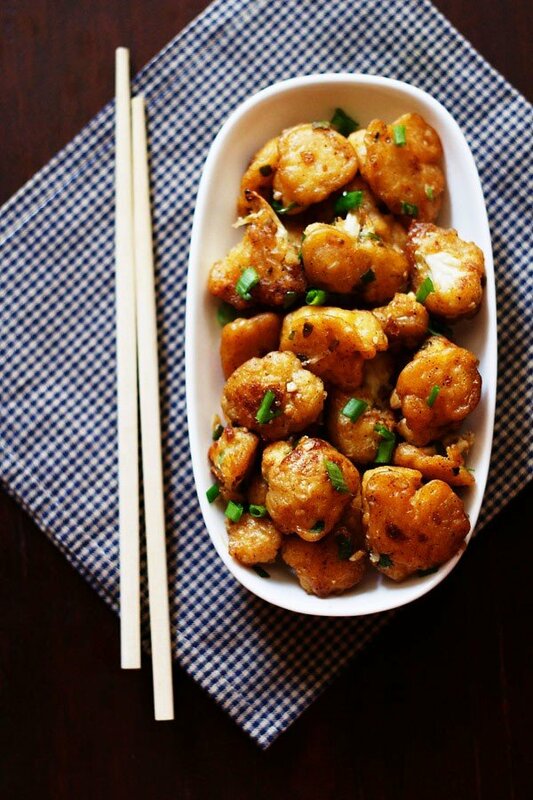 fry the batter coated gobi florets in hot oil. i have pan fried and added about 6 tbsp oil. later i have not added any oil while stir frying the spring onions etc. you can also deep fry or shallow fry. i have fried in batches of three. so depending on the size of your pan, you can fry at once or in batches. the frying takes some time. when one side gets cooked and crisp, turn over each gobi florets and pan fry the uncooked sides. flip for a couple of times more, so that the gobi florets are evenly fried and light golden. 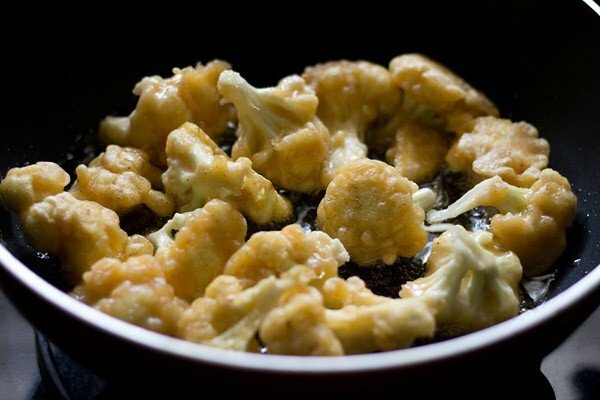 drain the fried gobi florets on a kitchen paper towel. 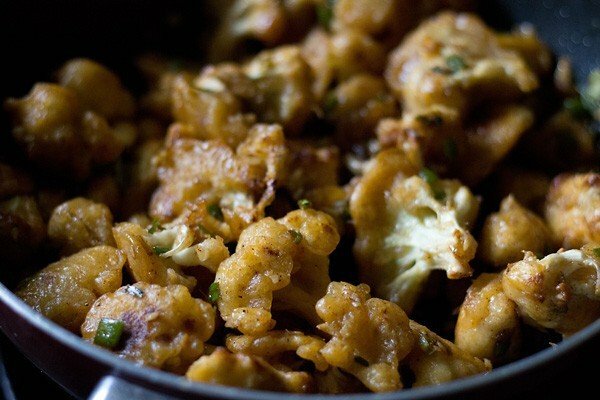 fry all the gobi florets this way in batches. no need to add any oil again. in the same pan, add chopped ginger, garlic and green chilies. saute for a half a minute. then add the chopped spring onions & capsicum. add chopped celery if using. increase the flame and stir fry till the capsicum is half cooked or almost cooked. add soy sauce, tomato sauce, black pepper and salt. stir. stir fry for two to three minutes ensuring the spiced sauce coats the cauliflower florets well. lastly add vinegar and stir well. check the taste and add more of soy sauce or tomato sauce as per your taste. switch off the fire. 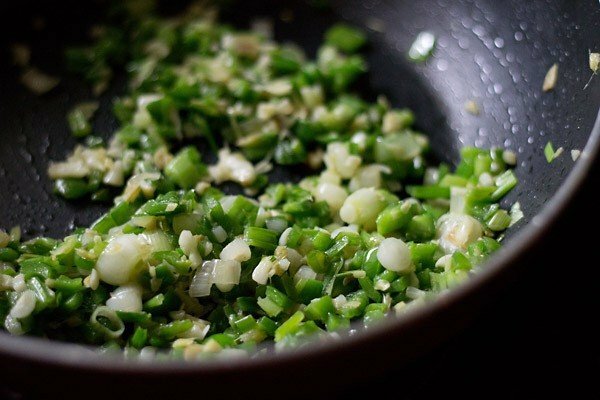 mix in the chopped spring onions greens or garnish with them while serving gobi manchurian. serve gobi manchurian dry as a snack or as a side dish with veg fried rice or mushroom fried rice or veg hakka noodles or veg noodles. 1. firstly chop or break the gobi/cauliflower in medium size florets. heat water with salt and boil it. 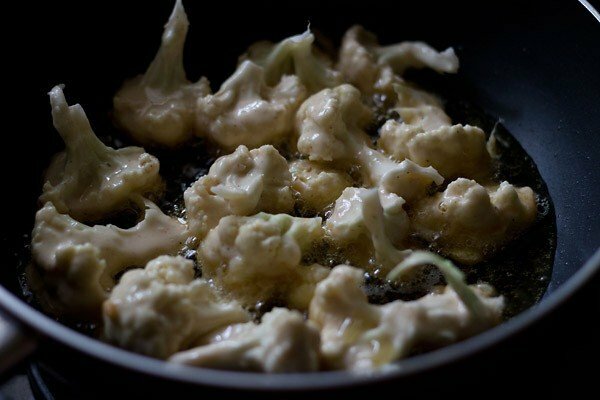 rinse the cauliflower florets and add them to the hot water. cover and let the florets get blanched in the water for 15-20 minutes. later drain and keep aside. 2. in a bowl mix together the dry ingredients for making the batter. 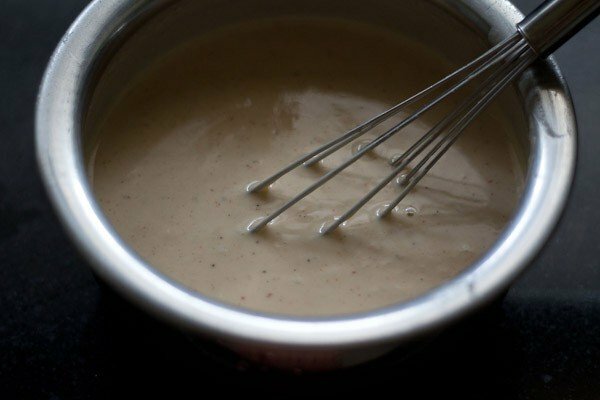 3. add water and whisk to make a smooth batter without any lumps. 4. dip each gobi floret in the batter. 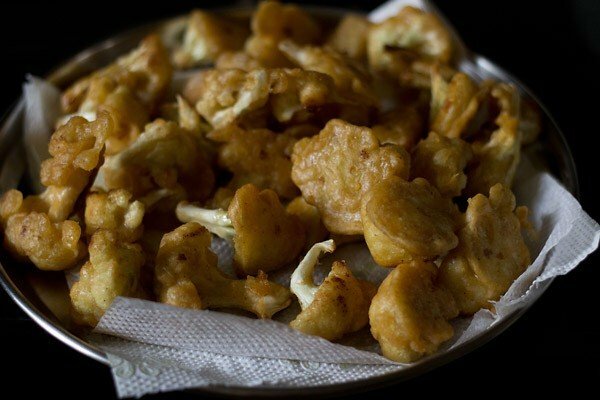 5. fry the batter coated gobi florets in hot oil. i have pan fried and added about 6 tbsp oil. later i have not added any oil while stir frying the spring onions etc. you can also deep fry or shallow fry. i have fried in batches of three. so depending on the size of your pan, you can fry at once or in batches. the frying does take some time, so patience is the key. 6. when one side gets cooked and crisp, turn over each florets and pan fry the uncooked sides. flip for a couple of times more, so that the florets are evenly fried and light golden. 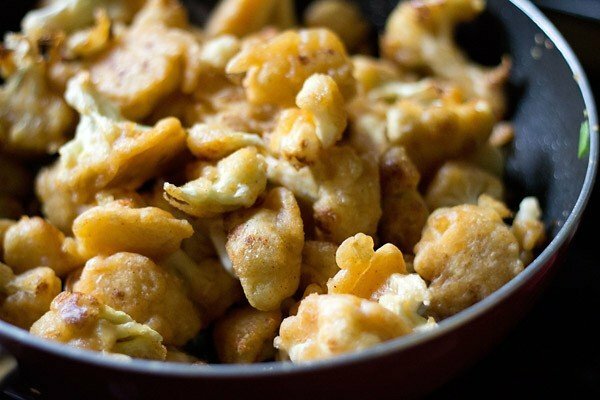 7. drain the fried gobi florets on a kitchen paper towel. 8. no need to add any oil again. 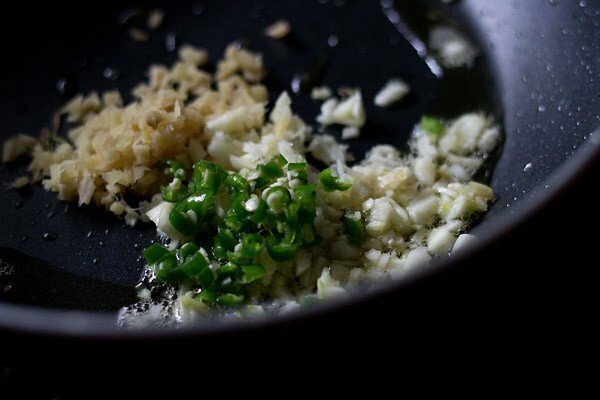 in the same pan, add chopped ginger, garlic and green chilies. saute for half a minute. 9. then add the chopped spring onions & capsicum/green bell pepper. increase the flame and stir fry till the capsicum is half cooked or almost cooked. 10. add soy sauce, tomato sauce, black pepper and salt. stir. 11. add the pan fried cauliflower florets. 12. stir fry for two to three minutes ensuring the spiced sauce coats the cauliflower florets well. lastly add vinegar and stir well. switch off the fire. 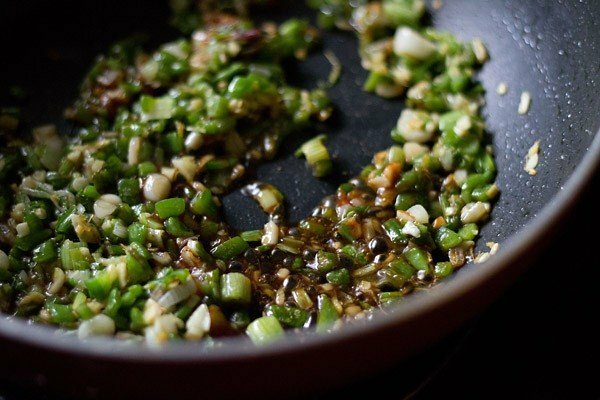 mix in the chopped spring onions greens or garnish with them while serving gobi manchurian dry. serve gobi manchurian dry as a snack or as a side dish with veg fried rice or schezwan fried rice or cabbage fried rice or mushroom noodles. Can I bake the florets instead of frying ? you can bake them. but they won’t be crispy. 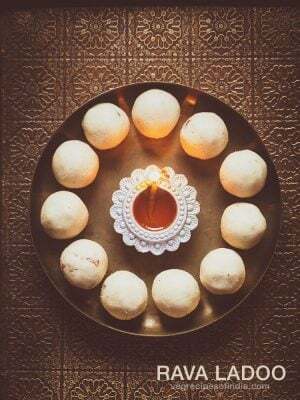 Dassana Thanks for this amazing recipe. Last time I shallow fried the florets. As you suggested it wasn’t crispy enough. I’ll be deep frying them this time. 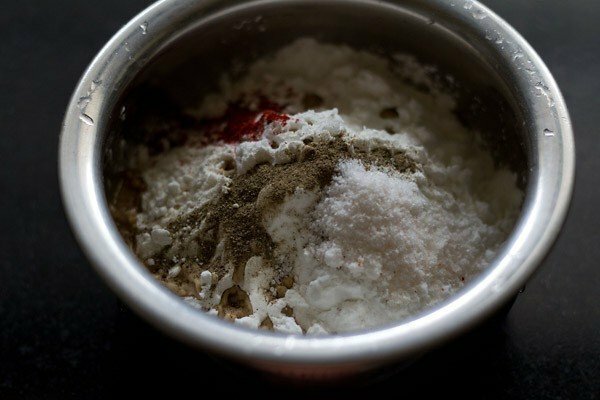 Could you advise if corn starch and corn flour are the same ? welcome arvind. corn starch and corn flour are same. This turned out perfectly! I had to give myself a pat on the back! It tastes like something offered in a restaurant. Just one question though. I had some batter that was left over and was wondering what I could do with it. I ended up discarding it but can it be stored and used later or is there any other way to use it? Thanks Anitha for your positive feedback. 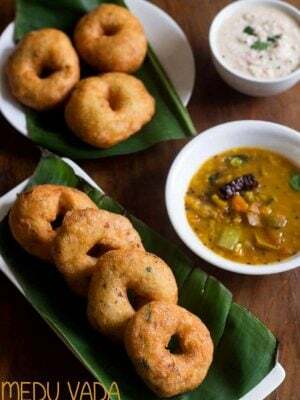 You can use any other veggie like potatoes, mushroom, french beans, broccoli or paneer with this batter.